The Delhi Police today arrested two suspected Lashkar-e-Toiba operatives who were allegedly planning to carry out a major terror strike at a crowded market in the National Capital. The duo, both of them Indian nationals, were arrested from South Delhi�s Tughlakabad Extension where they were staying on rent. In a clear message that he would stick to his stand on the scope of powers to the National Counter Terrorism Centre (NCTC), Union Home Minister P Chidambaram today asserted that without having the power to arrest, the NCTC would be handicapped in its counter-terrorism efforts. In a significant move to normalise bilateral economic relations, Pakistan today announced its decision to switch over to a �negative list� regime for trade with India, paving the way for formally according the Most Favoured Nation (MFN) status to this country by year-end. 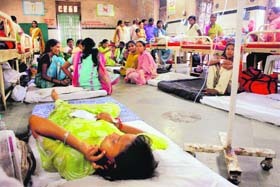 India will finally see raised public spending on health, cashless OPD services and free delivery of drugs through public health facilities. These key decisions were taken at a high-level meeting on health sector priorities held in the Prime Minister�s Office today. J&K: Pilgrim�s pick: Horseshoe taken for Rs 21,000! In Nellore, the southern, coastal district of Andhra Pradesh, hordes of migrant families from bordering Tamil Nadu have squatted along the cremation grounds to escape eviction from the local authorities. The children here play with femur and tibia bones, skull as the drum and use garlands worn by corpses. 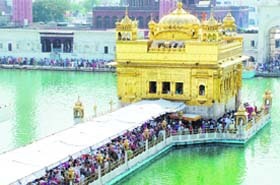 The Shiromani Gurdwara Parbandhak Committee�s move to install a fire and water-resistant fabric shed on the causeway between Darshani Deori and the sanctum sanctorum at the Golden Temple to protect devotees from the vagaries of weather, has not gone down well with heritage lovers.